Here’s a running list of things you can do and places you can go to take a break from all of the studying and test-taking this week. Fill the Kettle for Coffee is from 8 a.m. to 11 a.m. at the Criss Library. Make a donation to the red kettle and receive coffee and pastries. Support the Channel 94.1 Diaper Drive for the Lydia House from 11 a.m. to 1 p.m. in the HPER Gym. Students, Faculty and staff are invited to donate $2 for lunch (including Jimmy John’s sandwich, chips, and a drink). Your donation will benefit the Lydia House. If you bring a pack of diapers to donate you’ll be entered in a raffle to win UNO Branded prizes including: scarfs, beanie hats, selfie sticks, shirts, hockey pucks and more. Color me Calm is from 10 a.m. to 7 p.m. in the Criss Library. Relieve some stress by coloring a picture. building. Forming a 2- or 4-person team to play the human version of Hungry Hungry Hippo. Click here for more details. Winners will receive $25 on their MavCard. The game will double as a fundraiser for the Omaha Henry Doorly Zoo and Aquarium. Relaxation Station is from 9 p.m. to 11 p.m. in the CEC building. Donate $5 to the Omaha Zoo to gain entry to watch the Hungry Hungry Hippo contest which includes free food and games. Play-doh Sculpting Contest is from 11 a.m. to 1 p.m. in Room 130 of the CEC Building. Donate $1 to Children’s Hospital and enjoy play‑doh sculpting and Topper’s Pizza. Sculpting contest winner will receive up to $100 in MavCard money. Click here for details. Late Night Breakfast is from 9 p.m. to 11 p.m. in the Scott Café. Textbook BuyBack is from 7:30 a.m. to 5 p.m. in the UNO Bookstore. Sell your textbooks and receive a raffle ticket for a $500 gift card to use in the UNO Bookstore. Walk-In Resume Reviews is from 1 p.m. to 3 p.m in Room 115 of the Eppley Administration Building. The event features quick career coaching, cookies and cocoa by the ACDC staff. Free Chair Massages from 3 p.m. to 5 p.m. in the Maverick Village Clubhouse. Men’s Basketball Pre-Game is from 5 p.m. to 6 p.m. at Godfather’s Pizza in Aksarben Village. 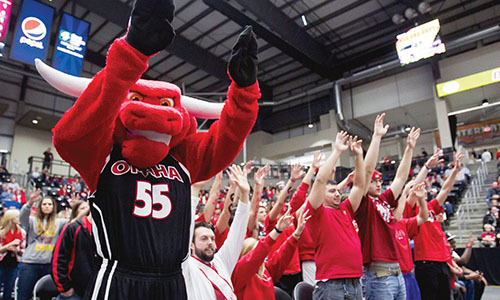 Join the Durango cheer squad at the UNO Men’s Basketball vs. Simpson College at 7 p.m. in Baxter Arena. Textbook BuyBack is from 10 a.m. to 4 p.m. at Mammel Hall. Sell your textbooks and receive a raffle ticket for a $500 gift card to use in the UNO Bookstore.